When Arlecchino arrives in Pisa with nothing to his name except two sore feet and an empty stomach, he decides he has had his fill of the servant’s life. But as he starts to scheme an exit strategy from the foolish Capitano he serves, his sorry state quickly invites the relentless mockery of the maid Columbina. To avoid further humiliation in her (admittedly beautiful) eyes, Arlecchino takes the only possible course: he lies. But while the tale of his master’s fictitious treasure might impress Columbina, it wreaks all manner of mischief upon the inhabitants of Pisa. Soon, a wealthy merchant throws over his daughter’s suitor in favor of the “rich” Capitano and Arlecchino then finds himself disguised as the young gentleman in an effort to fix matters (and perhaps elevate his own station in the process). 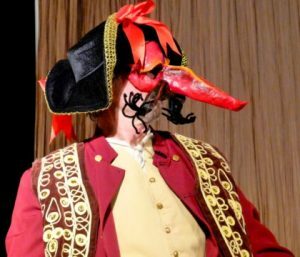 What’s more, the merchant’s daughter convinces Columbina to trade identities in order to escape the Capitano’s advances, and Arlecchino is caught between playing the part of the young lady’s suitor while fighting off the rumors of his unfaithfulness! As Arlecchino continues to tangle up the town’s affairs, it will take the quick wit of Columbina to unravel the mess he has created and reunite the young lovers… perhaps finding her own love in the process. Love, greed, and mistaken identity abound in this new tale inspired by the original Italian commedia dell’arte.